Where were you, dear Reader, that April day in 1986 when the Chernobyl meltdown informed us of the suddenly horrific powers we depend upon for our every civil convenience? Do you know that the biggest library fire in American history occurred that same day at the Central Library of Los Angeles? Rate these disasters as you will, you Book-Lovers, but do read Orleans' wholly accessible, ever-enlightening paean which, in her hunt to determine who or what caused the fire, clearly proves why billions of educated people, and a lot of the rest of us, hold the commonality of the library experience in reverent memory. A Bonus: this book is built! The full signatures held together with the finest modern glue in a unique sturdy laminated cloth and board binding makes this a book to read then pass on from one dear reader to another, with no due date. Already Emily Poole, Jackie Melvin and I have read the store copy, and it still looks new. 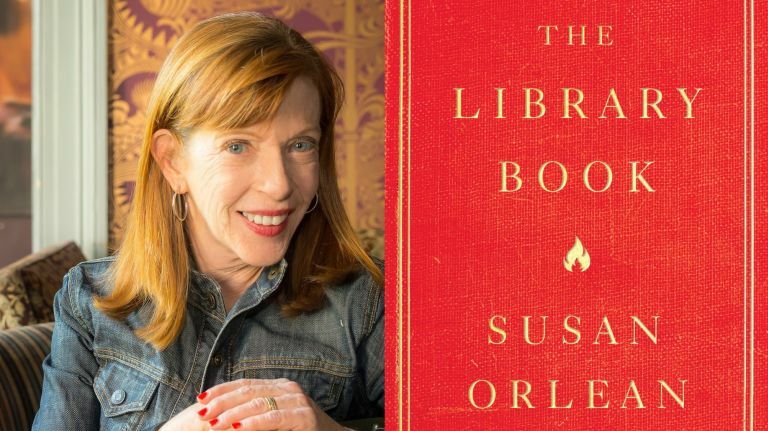 When she finished her last book, Susan Orlean declared that she would not write another—and oh boy, am I glad she broke that promise. I’m ashamed to admit that The Library Book is my first read by Orlean, but her riveting, accessible, and vivid writing makes me want to get my hands on her entire oeuvre. The Library Book alternates steadily between a wrenching, almost murder mystery-esque account of the 1986 Los Angeles Public Library fire and a contemporary examination of the library’s role in our modern techno-culture. Every fact that borders on dry comes with a juicy side dish of story and narrative that will keep you hooked. If you’re not a fan of nonfiction, this book will convert you. If you are, this book is required reading. There’s a nip to these October nights, and it seems that the browsers at Tsunami Books are collecting larger and larger stacks in preparation for what we book people know as reading season—the time of year where we shut out the cold, become one with our cushiest piece of furniture, and get lost in the pages. October also lines up in yards and grocery stores in rows of pumpkins and skeletons, and gets us all in the mood for a good old-fashioned spooking. It’s this time of year that I like to re-read my two very favorite books by Shirley Jackson, the queen of gothic horror. Her book “We Have Always Lived in the Castle” follows Merricat, her sister, and their ailing uncle—all that’s left of the Blackwoods after the unusual deaths of the rest of their family. A mutual mistrust between the Blackwoods and the townspeople has kept them in tense isolation… until strangers start to appear at the house. This deliciously eerie mystery will appeal to anyone who loves a spooky story where the rock of civilized society is lifted to reveal the monsters underneath. For those who prefer their scary stories on the more supernatural side, there is Shirley Jackson’s greatest work, “The Haunting of Hill House.” In this novel, an investigator of the supernatural and several companions visit a notoriously haunted house to stay there and observe the phenomena within; however, the house begins to exert an unexpected and terrifying influence on its guests. By no means do I recommend reading this short volume by candlelight alone in an old house, unless you have more fortitude than I. WHAT EXACTLY IS A PLEDGE? Folks, the next 10 days will tell the Future of Tsunami Books. We have not given the building owners what they asked for, but we have offered all we have generously received, and will continue with this very special Community Process to deal with the doubling of Tsunami's monthly rent.. Please feel free to click the above contact link and we'll send you a Pledge Form and S.A.S.E. One thing to keep in mind is that all Pledges will be viewed as loans, albeit unsecured. If we are allowed to continue here, we will include a Loan Agreement with a call for the turning in of Pledges. Sunday, April 23, 4-7 PM: The NeverEver Band (Barry Burleson, Kathy Burleson, Kriss Crowley, Ralph Novak, David Bersch.) and Wild Hog in the Woods https://www.youtube.com/watch?v=bKQKCgvdxYQ have kindly offered to play their hearts out in a Benefit for Tsunami. A Rent Party in the classic sense. Step away from the garden and come give a listen! Donations at the door. Thank you, Folks, for Record Sales in both February and March! We're happy to work hard for your business. The Pledge Campaign continues to gain momentum. Tsunami has now received over $90,000 in Pledges! (Please, money NOT due at time of pledge) Well over 600 pledges have been turned in. Many pledges are non-monetary. Over 1700 Pledge Forms have left the building. We have "redacted:-)" the deadline. THE LATEST NEWS is that all Pledges will be viewed as unsecured loans. This has many benefits for all involved, and, if successful, will prove Tsunami Books a successful business in the one way all poor people have stuggled (financially). Tomorrow morning, Wednesday, April 4, 2017, our Letter of Intent to secure a new 5+ year Lease here at 2585/2595 Willamette goes in the mail. A well-respected business and mediation lawyer in the neighborhood has offered his services pro bono. We should know this month if the opportunity to continue AND grow at our home for 22 years is real. There is a lot of work to do, but the community continues to show its support in many beautiful ways. Let's all have a Spring to remember! The Pledge Campaign is gaining momentum, Folks: Tsunami has received over $65,000 in Pledges! (Please, money NOT due at time of pledge) Close to 500 pledges have been turned in. Many pledges are non-monetary. This Community Process continues to grow, taking both amazing and surprising shape. Please feel free to click the above contact link and we'll send you a Pledge Form and S.A.S.E. (someone just requested 10!). Folks, As of today, March 1, Tsunami has 30 days to turn in a viable proposal to lease these digs for the next 5+ years. We need you--preferably thousands of you supporters of Tsunami Books--to turn in Pledge Forms. ALL GESTURES OF SUPPORT ARE NEEDED. One 11 year old girl pledged to continue to trade here if we stay open. A pastry chef pledged to create a chocolate-raspberry crepe big enough for everyone who came to the (Arun) Gandhi Talk and Benefit for Tsunami last week. A local restaurateur has pledged to offer us catering services for future events. A retired librarian, who can no longer read, and has short moments left before the FINAL Book comes due, came to the store and signed a pledge of thanks for the times we talked about trees. Someone else pledged to help me create a business plan. Someone else pledged to spread a thick layer of wood chips from this year's storms to help our 6 trees along 26th Street. People have pledged everything from simple thanks to many thousands of dollars. Folks, this is the moment that will decide the future of Tsunami Books. Please feel free to be a part of it. Drop by the store this Saturday, or anytime this month, to pick up pledge forms for the whole family. Or click this link to take you to the Pledge Page on our website http://www.tsunamibooks.org/support/ . Most of all, thank you for the opportunity to experience this heartful, generous lesson in Community process. Today, Tsunami was fortunate to receive a $4000 pledge. The process continues! It is heartening to have support at many different levels. Yesterday, February 8, was Show-of-Support for Tsunami Day, which marks the first of a 50-day process to try to secure another 5+ year lease at 2585 Willamette. Upwards of 500 good people came through. The first day pledge total was something over $33,000. As bookstore campaigns go, that is the best result I have ever heard for a first day (someone needs to get in touch with The New York Times:-). Please drop by the store and pick up a Survey and Pledge form, and maybe a few for your friends? Or copy one or a few off our Tsunamibooks.org website at http://www.tsunamibooks.org/words/. The process has been great so far. The organizing, volunteering, meeting, heartful giving. This is something we all need a little practice with for these trying days ahead. Thank you very much for your efforts! No predicting what will happen; it's all about the process for now. The Lease for Tsunami Books is up June 30, 2017. There are other major business concerns that want to take over this property beginning July 1, 2017. We want to keep our Community Bookstore and Cultural Center growing here at 2585 Willamette Street in beautiful South Eugene, but do not yet have the financial resources to stay. We have asked for, and kindly received the opportunity to deliver a proposal to the building owners for a minimum five-year lease. The deadline is March 31. At the very least, the rent will double. On December 28, 2016, a Public Meeting was held. Thirty-nine people participated. Since then a growing number of motivated members of the Community have stepped up to help, and after five meetings a highly creative plan is being formulated. To that end, WE INTEND TO RAISE +/- $400,000 BY MARCH 30TH TO SECURE A NEW FIVE YEAR LEASE WITH OPTIONS. The key question: Is there enough support from the Community that is Tsunami Books to energize this movement? To help us find out, please drop by the Bookstore, even for a moment, on Wednesday, February 8, from 10 AM-9 PM. That’s the day we’ve picked as Show-of-Support for Tsunami Day. We’ll be taking a head count, and we’ve got a very simple 4-question form we’d like you to fill out, with copies to share with your friends. Volunteers from the ad-hoc committee and Scott (prez and gm) will be here all day to answer your questions and listen to your ideas. The newspapers, tv, and radio are all being notified. Let’s share a laugh and a tear of joy, and get on with the effort to make our own good way in this crazy new world. An initial "Public Meeting" about the Future of Tsunami was held on Wednesday, December 28 here at the Bookstore. Approx. 35 people, ages 4 to 70+, participated in statement of facts, q & a, and discussion. Basically, the Tsunami Books Lease is up come June 30, 2017. It is possible to acquire a new lease, minimum 5 years, at a considerable increase in rent. How to guarantee the rent is the question. The answer will likely need to appear in January if Tsunami is to continue at its present location. The meeting lasted just under 2 hours. No one left. Many folks considered it a very good first meeting. A general email group named "The Future of Tsunami" was formed (all emails kept private here at the bookstore, group messaging through bcc), as well as two specific smaller groups: "The Future One" includes folks who have both interest and the financial capability to help plan and secure Tsunami's future at 2585 Willamette; "The Future Two" includes folks who are interested in a more general brainstorming toward a long-term, permanent home for Tsunami, and possibly other compatible for-profit and non-profit businesses. Please email me (Scott) at tsunami1@opusnet.com if you would like to take part in the general email (update) group, or either of the active sub-groups. I'll send you a facts sheet, an email form, and a statement entitled "Securing the Future of Tsunami." These you are welcome to share around. It should be noted that a meeting for "The Future One" is scheduled to occur next week. Please email me if you might care to attend. Wednesday, December 28, 7 PM: Public Meeting regarding The Future of Tsunami Books. The Lease for Tsunami Books is up June 30, 2017. Will it continue at its present location, will it be moved, or will it dissolve? The facts will be presented, followed by a question and answer, and discussion period. An as-yet unscheduled second meeting-by-invite will be held to deal with specific finacial issues. Please email Scott at tsunami1@opusnet.com with questions/comments. Our 21st Anniversary Sale is now behind us. Thank you very much, Folks, for the best Anniversary ever! 2585 Willamette is possible. Not easy, but possible. For One: It's going to take a gathering of what are called "Angels;"
likely both individual Angels, and a community of Angels. If you are a potential "Angel," or know one, please feel free to email me, Scott, here at tsunami1@opusnet.com. A meeting will soon occur, and it would be good if you would consider coming. Number Two: Tsunami Books Inc needs a second full-time working owner. One (me, Scott Landfield), age 63, with no money, is not enough to keep this place growing as a Bookstore and Commuinity Center. Tsunami was conceived and built as a place for at least two worker/owners. Know someone who might like the idea of being a working owner of a Bookstore/Performance Center/Publishing House? Email is a good way to start. Number Three: The time to get things moving is Now. Time is limited. People (angels) will need to come together, a plan developed, and a substantial business decision made. Number 4: This fiscal year that (technically) began July 1, 2016 must be our best, both from a business, and from an events point of view. So far so good. Let's all have an especially good holiday season. Folks, Tsunami Books is still in the running for another 20 years at this location. To be honest, I am shocked, pleasantly so, by this latest information. Certainly many people come by, both curious and hopeful. Personally, I'm not into hope, I'm into action. For now, I'll keep the information flow up-to-date using this Facebook Page, as well as our email list. And we'll have hard-copy information at the counter, so drop on by. Let's do something about the future. Performance Piece created by Lisa-Marie DiVincent and Scott, performed at Emily Semple's fundraiser. Our Gift Certificate (Giftcard) Campaign ends August 3, so the time to pick one up is Now. Crowd Funding through the purchase of Gift Certificates (Giftcards) goes well. Many folks are coming in and buying them across the counter, and Tsunami's Indiegogo site has already garnered almost 1300 views. Most important is the outpouring of good feelings, well-wishes, and ideas. In particular, there are already exciting ideas beginning to percolate outside the store that are seeping in. It is clear that this year beginning July, 2016 needs to be the best yet for Tsunami Books, both as a very small business and, more important, as a center for all the communities who use this Bookstore as a backdrop for their activities and events. Now is a great time to purchase Tsunami Books Gift Certificates! We want to sell 200 Giftcards (Gift Certificates) in 30 days. Tsunami Books Indiegogo Crowd Funding Campaign. including ticketed music, theater, and poetry performance events. Folks, this begins an ongoing update and discussion regarding the above theme. It will be Included in all monthly emails, and will be updated regularly on our Facebook Page and website, at http://www.tsunamibooks.org/words. These writings will all be initiated by me, Scott Landfield, 20 years a working owner, and de facto Mayor of Tsunami Books. It should be understood that, without new and exciting, if presently unknown help from outside the Bookstore, keeping Tsunami Books alive and thriving beyond July 1, 2017 is impossible. Tsunami Books has been at 2585 Willamette Street in beautiful South Eugene for 21 years. Last year at this time we signed a two-year lease extension after completing a Crowd-funding Campaign ( https://www.youtube.com/watch?v=3K5tdX1cOPE ) that allowed us to cover a part of the increased costs of keeping this working-class bookstore alive and healthy, if still poor. Sometime soon after July 1, 2017 there are plans to level this building, tentatively replacing it with a two-story retail building, with rent at approximately double the present rate. One thing is absolutely certain: Even though Tsunami Books began with no money, and still has no money (literally, not figuratively, no money), these times a’comin’-- the retail sales, the events, the hearts touching hearts--between now and July 1, 2017 need to be the best ever here at the Bookstore. If they are, opportunities for a future life may somehow materialize. And if a next incarnation of Tsunami Books does not materialize, then it’s all the more important that, beginning today, this Bookstore needs to thrive in all ways. Not to go out in a blaze of glory, but to continue the blaze of glory, and see where it leads. Peter Brown Hoffmeister’s first young adult novel, This Is the Part Where You Laugh, opens with the young protagonist Travis releasing two small South American crocodiles he bought from a guy who posted a flier at the Chevron station—caimans—into the little lake in the middle of the North Eugene neighborhood where Travis lives. The book is compulsively readable from the first page. When he’s not writing, Hoffmeister teaches English and outdoor skills at South Eugene High School in the Integrated Outdoor Program, and is well-loved by his students. As a teen, he ran away from home and got expelled from two boarding schools. He was placed in a minimum-security “life challenge program” in East Texas after facing legal troubles, and ran away from that too. He finally ended up at South Eugene as a student and met an English teacher who mentored him. Now, as a teacher, he mentors troubled students. The circle continues. This Is the Part Where You Laugh focuses on teens struggling to be as good as they can in bad circumstances. The novel deals with addiction, homelessness, racism, violence, abuse—and the hope and humor that keep its characters trying in spite of all that. Place names invoke a kind of magic in writing—a magic of specificity. For me this magic comes through even when I know nothing about the places being named. When Travis rides his bike on streets I’ve been on—Gilham, Green Acres, 7th—and along Eugene’s river bike path, I thrill. A place I drive by every week—the park under the Washington-Jefferson Bridge—is the setting for one of the novel’s most crucial scenes, and it makes me drive by a little slower, look closer. The novel is full of characters with complexities that make them heartbreakingly realistic: Travis’s homeless junkie mom, his grandparents in their mobile home, Natalie the girl across the lake, and his best friend Creature. And Travis, who tries over and over again to be good and do good, who keeps screwing it up, but keeps on trying anyway. It’s hard to watch, hard to read, but it’s a huge part of what makes this book so good. More than anything, it’s a book about compassion—about hearing perspectives it would be easier to ignore. Travis says, “Sometimes I get mad or jealous when I think about other people’s parents, but mostly I get confused. Why are some people the way they are, while other people are like my mom? It’s easy to say it’s the drugs, but what was it before that? Maybe we need to ask more questions.” That’s what it’s about: asking those questions. Tsunami Books will host a book release celebration for This Is the Part Where You Laugh on Tuesday, May 17th at 7pm. The book is also for sale on our shop with free shipping anywhere in the USA!